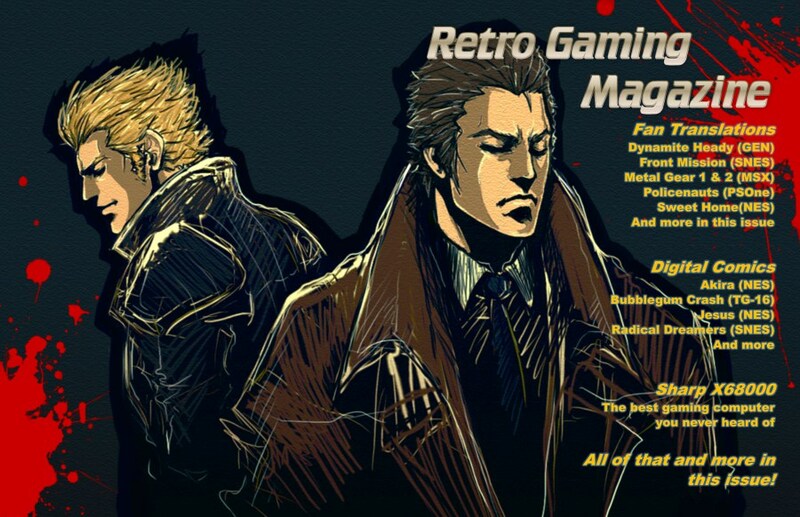 We sit down with Retro Gaming Magazine’s Carl Williams to explore the retro gaming genre. We here at Nintendo Love Affair have covered the Coleco Chameleon Saga (patent pending) extensively over the past couple of months. With purported involvement from companies like Piko Interactive, Collectorvision and Interworks I began this adventure as a potential early adopter for Retro Video Game Systems. I, like many, let the nostalgia bug bite me hard. The idea of purchasing new and classic games for a cartridge based system excited me. That sensation of hearing the satisfying click of the cart being locked into place is a tactile reward that, I argue, makes the 3DS such a timeless system for every generation of gamer. Carl has been reporting on the Coleco Chameleon since its first iteration as the RETRO Video Game System. For over a year he has kept an eye on the development team and others involved. While many mainstream gaming outlets have offered shallow coverage for the system, and the retro scene, Carl has continued to dig and report as objectively as possible. NLA: Thank you for giving us your time! Why don’t you go ahead and tell us a bit about yourself. Carl: My name is Carl Williams. I have been a gamer since the days of Pong and then the Atari 2600. Maze Craze was my first real “game”. I have been involved in gaming in a semi professional capacity for nearly a decade. I started writing “for experience” then quickly moved into running a site of my own. I have also worked in magazines throughout that time having worked as the Retro Editor for Gamefan Magazine. Currently, I co-own Retro Gaming Magazine and Gravis Ludus. NLA: Please tell us a little more about Retro Gaming Magazine. How did it all begin? head, something that would bring journalism back to gaming publications. He passed prior to us being able to fulfill that dream so my business partner, Nick Abrams, and myself decided to forge ahead with RGM in remembrance of Bill. NLA: What would you say Retro Gaming Magazine is most known for? Carl: Our most popular articles are our historical articles. We strive to work with others in the retro gaming community. Together is how we grow the scene as a whole. NLA: RGM started as a physical magazine right? 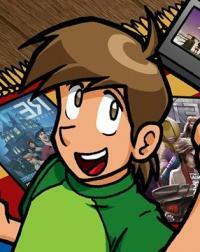 Carl: The preview issue of RGM was made available in early 2012 with two regular print/PDF editions released in 2013. We discontinued print efforts due to time constraints amongst staff involved. RGM at the moment is just a site. We do still have the two issues available. NLA: So why the retro scene? With so much happening in modern day gaming, why keep looking back? Carl: It boggles my mind that there is so much cool stuff that is being ignored by the media for one reason or another. Even today, many retro topics are not covered anywhere else, not on the web or in print. When we return to print we will do what we have been doing on the site since day one and that is cover the stuff others will not. NLA: So you have a plan to return to print? over two a half years later, I still receive the occasional email complaining about my layout work. Or someone will complain in the comments on one of the distribution services we use, or on our Facebook posts for the mag. That is fine. They at least read the magazine and cared enough about the content and overall magazine to take the time to leave a comment. That speaks volumes to me and my team. NLA: So when is the relaunch? Do you have a date? Carl: We were planning on relaunching in January of this year but personal life got in the way of too many of the staff involved so we scuttled that plan. I chose to wait to do it right rather than push forward with an obvious half hearted attempt. Keep your eyes on our site and our social media because you never know what we have planned. NLA: We have seen the greats such as Nintendo Power and Electronic Gaming Monthly come and go. 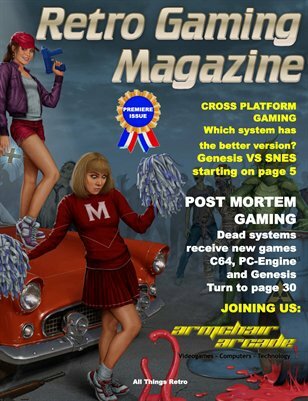 Do you think there is a space for a print magazine covering retro games? Or even, games in general? Carl: Personally, I think a lot of people are over estimating just how big the retro community is. Judging by the stats of RGM, my experience with other sites and publications and my game developer connections it is not as big as most think. 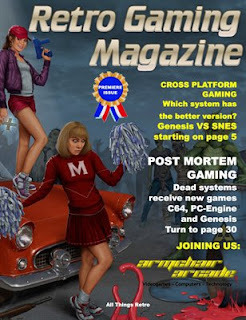 We are never going to see another season of 400+ page count magazines and we will not see anyone become rich off publishing retro gaming magazines. Those days are long gone. 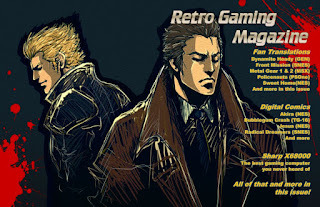 NLA: So what can Retro Gaming Magazine do to stay relevant? Carl: Retro magazines have to focus on things not given on websites if they are to succeed. Simply reviewing Super Mario Bros 3 again is not going to push any sales of your magazine. NLA: So, how do you define retro gaming? Am I retro gaming when I play my DS? 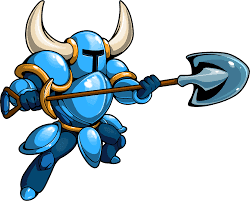 Is Shovel Knight considered retro gaming? Carl: Retro gaming by definition is going to be a moving target. What I, at 39 years old, consider retro is going to be different than someone that is 16 and just started gaming or someone that is 8 and enjoying his new 3DS. No one can really define that definitively. NLA: Mr. Nillo over at StopDrop&Retro made an interesting observation about the retro community. He stated that projects like the Coleco Chameleon popping up are a sign that the niche is growing. What do you think of that? Carl: The retro gaming scene is always growing. Things like the Chameleon effort are just a continuation of the growth. Other signs of the growth are services like Video Game Authority or whatever it is that grades games and seals them up for you. That does not necessarily mean that it is a good sign. It just shows that there are people that are quickly parted with their money. NLA: But, as you said earlier, you don’t think the community is as big as some believe? Carl:The retro community is more vocal than it is large. If there was as much growth as people think there is, why are we not seeing NEW games developed professionally by companies like Capcom and Konami and released on platforms such as the Super Nintendo or Sega Genesis? NLA: So what about retro-inspired games such as Yacht Club Games’ Shovel Knight? Are they there to fill that niche? Carl: True retro would be to release them on a retro console. While games like Shovel Knight are cool, they are not retro in the sense that SNES is retro. These games are simply retro inspired. I personally feel they are “neo-retro”, a term I first heard on The Retro League podcast. NLA: So what do you think is in store for the future of retro gaming? Does the future hold more attempts at retro systems like the Coleco Chameleon? Carl: I think there is room for new consoles that are hardware limited to a time when things were a little simpler to program. We see this nearly every day with releases by developers for old consoles already from Super Nintendo to the Amiga computer. There are new games being released quite often. NLA: Alright, let’s get into the Coleco Chameleon and Retro Video Game Systems. What kind of impact does that company and system have on the retro community? Carl: Ultimately the success, or failure, of the Coleco Chameleon will have an impact on the retro gaming community just because it is so polarizing. You either believe in RETRO Video Game Systems Inc, even though they have yet to show anything tangible in 12 months of talking, or you are calling B.S. on the whole thing. Anyone that has read any of my articles on the Coleco Chameleon will know I have tried to keep a professional and unbiased point of view about the matter, simply stating the facts and asking pertinent questions. Those have gone completely ignored by RVGS Inc management. NLA: I have asked this of both Piko Interactive and CollectorVision. What could RVGS have done to fix their situation? Carl: It is a shame as just a little bit of discussion, a little bit of Q&A with the community could have gone a long way in keeping this from getting out of hand like it has. With all of the news they made from the New York Toy Fair debut of a “prototype” and promoting that they were going to be on Kickstarter answering questions and correcting concerns only to no show and claim a mysterious benefactor has stepped up and now they will be privately funding this thing. NLA: Which we have heard nothing about except for a mysterious twitter post. Carl:They seem to have abandoned the retro gaming community long ago and prefer to aim for the much more lucrative mainstream market. It remains to be seen if this mysterious benefactor has the clout to make those dreams come true. NLA:So what was the Chameleon’s biggest problem? Carl: Their big problem is that they are putting the console shell before the games and that is not the recipe for success. No one bought a Nintendo 64 because they thought it resembled the 3DO in some unique way. They bought if for Mario 64. Sega Sold tons of Genesis consoles when they launched Sonic. Nintendo’s SNES sold well because Super Mario World was a pack in. The Coleco Chameleon team needs games, better yet, they need exclusives. Simply having developers drop the exact same game from the SNES on a Chameleon cart and asking gamers to buy it is not going to go well. Even if they get developers to add an extra character, a new level, or something like that which is exclusive to the Chameleon version is better than just a straight port. NLA: So will a retro effort like the Coleco Chameleon succeed? Carl: I do hope it succeeds as it would be great to see a retro console war in 2016 as the Coleco Chameleon, doubting it will continue using that name, is not the only new retro console that could debut this year. Unfortunately more details about other retro systems could not be disclosed. NLA: There seems to be a consistent misconception that companies like Piko Interactive and CollectorVision are “in bed” with Retro Video Game Systems. Do you think those companies have sullied their name by being involved with the project? console’s announcement. Piko has handled the situation quite well with being involved in the community, answering questions, discussing their involvement and point of view as much as they can while keeping professional. That is how you handle a fiasco. Not by being silent and deleting negative comments from your Facebook or ignoring the problem. NLA: Closing thoughts on the Chameleon? Carl: The focus needs to remain on the games. As they say, there is always more money in selling the razor blades than there is the razors.